These durable, scratch-resistant, acrylic mirrors give beginning artists the chance to work with a live model — themselves! Perfect for classroom portrait projects, the Self Portrait Mirror stands securely on any flat surface, reflecting your image clearly as you sketch, paint, or draw. 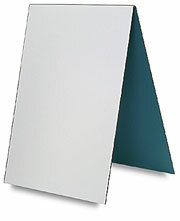 These mirrors can also be helpful as a visual aid during speech therapy sessions. Choose the single mirror for individual use, or the double-sided mirror for use by two artists (or a speech therapist and patient) at the same time. The mirrors on both models measure 8½" × 11" (22 cm × 28 cm). Note — These mirrors are shipped with a protective film covering the surface. Please remove the film before using to ensure a clear image.